Thank you so much for making my feet happy again. The difference is amazing! The best thing though, is that after years of pain, I can finally run pain free and it is just incredible. I have written a diary of the training that I did after my operation up to completing the Langdale Half Marathon. My training is going really well and I am up to 17 miles off road now running in the hills around Kirkham Priory. This is my diary from my bunion operation on the 12th of May 2012 to the Langdale Half Marathon on the 22nd of September 2012. The last run before my operation was 14 miles in the Lake District on the 22nd of April. 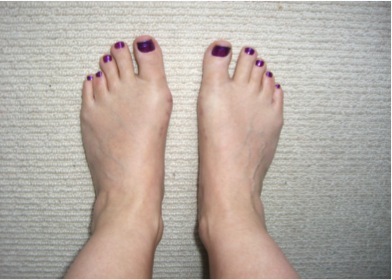 12 May 2012 - My bunion operation, I had three and a half weeks off work. I returned to work on the 6th of June 2012. I had to travel from York to Leeds on the train in my lovely black sandals and with my walking stick. 10 June 2012 - I purchased my new trainers which were a size 7 – I was a size 5 before (or so I thought.) I could walk unaided slowly in my trainers and continued going to work. 18 June 2012 - I started to cycle from home to York station (only 2 miles.) I just went slowly and used the centre of my feet. I improved every day. I was careful and made sure that there was no pressure on the front of my feet. 25 June 2012 - I had my 6 week check-up with Dr Budgen. He said that the bones had fused and healed OK. He said that I could start running and should be OK to run my marathon on the 22nd of September. 30 June 2012 - I walked 1 mile. 01 July 2012 - I ran 2 miles. 10 minute miles. I was back – Yippee!! 05 July 2012 - I ran 2.11 miles. 10 minutes miles. 18 July 2012 - First run after my holiday – 3 miles. 10 minute miles. 21 July 2012 - I ran 2.9 miles. 9.57 minute miles. 24 July 2012 - I ran 4 miles. 10 minute miles. 29 July 2012 - I ran 6 and a half miles. 11 minute miles. 05 August 2012 - I ran 8 and a half miles. 06 August 2012 - I ran 5 and a half miles. 10 minutes miles. 11 August 2012 - I ran 10 miles. 18 August 2012 - I ran 3 miles. 9.45 minute miles. 15 August 2012 - I ran 9 and a half miles. 02 September 2012 - I ran 12 miles. 10 minutes miles. 08 September 2012 - I ran 9 miles. 22 September 2012 - The day of the Langdale marathon. I decided to change from the Marathon to Half Marathon due to my lack of distance training. I DID IT!!!! 13.1 miles. I ran it in 2 hours and 28 minutes (it is very hilly.) I was so chuffed. I loved it, running around my favourite place – and – for the first time in years – with pain free feet.